Sheet metal fabrication is a handy set of manufacturing processes used to create parts from flat pieces of metal. 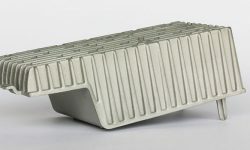 Sheet metal comes in a range of materials and thicknesses, and can be used to create parts like appliances, enclosures, brackets, panels and chassis. For those new to sheet metal fabrication, the process can seem daunting. Unlike versatile processes such as 3D printing and CNC machining, sheet metal fabrication is dictated by fairly strict design conventions. Sheet metal must be bent and cut in particular ways, and is only suitable for certain parts and products. As such, it is important to learn some basic principles of sheet metal fabrication before embarking upon a project. Courtesy of rapid prototyping specialist 3ERP, this guide offers five simple tips to improve sheet metal parts, turning ordinary designs into professional-quality sheet metal products. Sheet metal fabrication is a set of manufacturing processes that share one common trait: they all use sheet metal — as opposed to blocks, powder or molten metal — as feedstock. 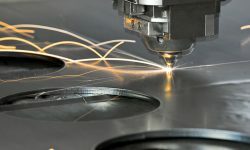 Different machines form the sheet metal in different ways: some make holes or incisions in the sheet metal; others bend, stamp or spin the metal to turn it into various shapes. Using sheet metal fabrication, engineers can create durable, low-cost parts from a wide variety of metals. These parts can be used across a range of industries, from aerospace to medicine to robotics. The sheet metal used in the manufacturing process is usually between 0.006 and 0.25 inches (0.015 and 0.635 centimeters) thick, with the chosen size dependent on the given material and end-use of the part. Sheet metal fabrication is unique amongst the various manufacturing processes because its feedstock is unlike any other. 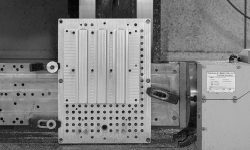 For this reason, it can be difficult to design sheet metal parts when one is used to designing parts for machining, molding and other common manufacturing processes. While the best way to ensure high-quality sheet metal parts is to consult and utilize a sheet metal specialist like 3ERP, it is also advantageous to follow certain design principles from the outset. By observing the following five tips, designers can create sheet metal parts that are strong, easy to fabricate and resistant to breakage. Since sheet metal fabrication is frequently used to create enclosures, brackets and similar items, holes and slots are often required for screws, bolts or interlocking sections. Holes are usually created with a punch and die mounted in a press, allowing for a precise circular shape to be cut out of the sheet metal. But if holes are not correctly made, the hole may deform or even cause the part itself to break. When punching holes in sheet metal, a few important rules should be followed. Holes should be 1/8” from any wall or edge (1/16” if the sheet metal is thinner than 1/30”) and should be spaced apart by at least six times the thickness of the sheet metal. Furthermore, the diameters of all holes and slots should match or exceed the thickness of the sheet metal. Sheet metal can have rough or sharp edges, so ‘hemming’ those edges — folding them in on themselves — is a good way to make a sheet metal part safe and functional. Hems can also strengthen a sheet metal part or play a functional role such as housing a pin for a hinge. Hems can be open, closed or teardrop-shaped. When adding a hem to a sheet metal part, a few guidelines should be followed to ensure optimum performance. For starters, it is almost always better to avoid closed hems — those in which the material is completely folded on itself — unless absolutely necessary. Closed hems risk damaging the material because of the extreme angle of the bend, so open and teardrop hems, which leave a gap between the two sides of the hem, are preferable. When making an open hem, the diameter of the gap should match or exceed the thickness of the sheet metal. The return length — how far the hem goes ‘back on itself’ — should be no less than four times the thickness of the sheet metal. The same guidelines apply to teardrop hems, with the additional requirement that the opening at the end of the return is no smaller than 1/4 the thickness of the sheet metal. Bending is one of the most important forming processes in the realm of sheet metal fabrication. Using equipment like brakes and machine presses, machine shops are able to manipulate sheet metal into new shapes — though some materials are better suited to bending than others. Following certain rules regarding bends ensures an accurate and even bend, and reduces the possibility of damage to the material. One rule to follow is that, when designing a sheet metal part with bends, the inside bend radius should match or exceed the thickness of the sheet metal to avoid deformation. Additionally, maintaining consistency in bend direction and radius can help to reduce costs, as the part will not have to be reoriented and the bending equipment can repeat one identical procedure. Notches and tabs are features of sheet metal parts that are useful for adding screws or fasteners or for slotting multiple parts together. Notches are small indents in the edge of a part, while tabs are protruding features. A tab in one sheet metal part is often incorporated to fit into a notch of another part. Like other sheet metal features, creating suitable notches and tabs entails following certain rules. Notches should be around 1/8” away from one another and at least as thick as the sheet metal. Tabs should also be spaced apart from one another — of a distance equal to or greater than the thickness of the sheet metal. Furthermore, a tab’s length should be equal or less than five times its width. Although sheet metal parts often have relatively unglamorous applications, they sometimes still need to undergo one or multiple finishing processes before they are ready to use. Depending on the application and material used, sheet metal parts can be finished with bead blasting, anodizing, plating, powder coating and various other processes, either for functional purposes or to simply improve the appearance of the part.